I want to thank Senator Scott Brown for endorsing this campaign in the 2nd Congressional District against Richard Neal. I will fight to stop the growth of the federal government and will promote liberty as your next Congressman. We need better jobs and less taxes – I will join Senator Brown in his efforts to restore the American economy and to get us moving again. 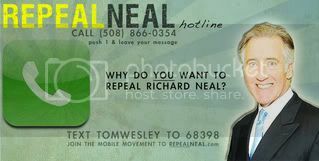 Please join Senator Brown and sign up on our splash page – I want to connect with you to inform you about how we will Repeal Neal in 2010. Congressman Neal has been in Washington for 22 years, he has not had a challenger in 14 years, and he votes with Nancy Pelosi 98% of the time. This 2nd District needs new leadership, and a new direction. I am honored to have the support of Senator Scott Brown. I would also be honored to have your support, please sign up right now.